Built in 1858, the Point Betsie Lighthouse is located on a wide sweeping point just off M-22, 5 miles north of Frankfort. 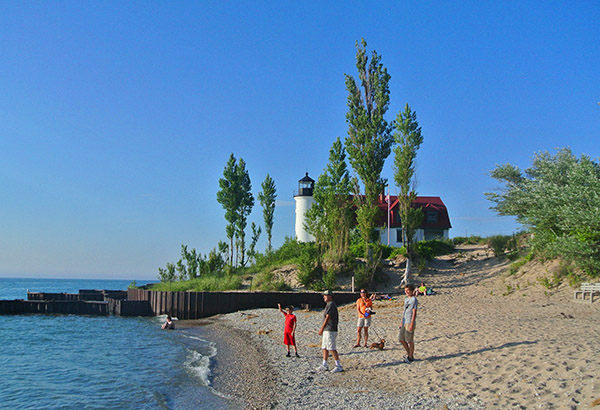 The red and white tower and lightkeeper's house is framed in by a pair of green pine trees behind it and often a deep blue sky above it, with the Lake Michigan surf rolling in on one side and golden sand everywhere else. In the evening, locals and tourists alike arrive at the beach to watch the sun dip into the shimmering horizon of Lake Michigan in what has become Benzie County's most enduring summer tradition. But Point Betsie is more than a picturesque lighthouse or a place to watch sunsets. It is also a natural wonder, a dynamic mosaic of shifting sand dunes and Lake Michigan shoreline. 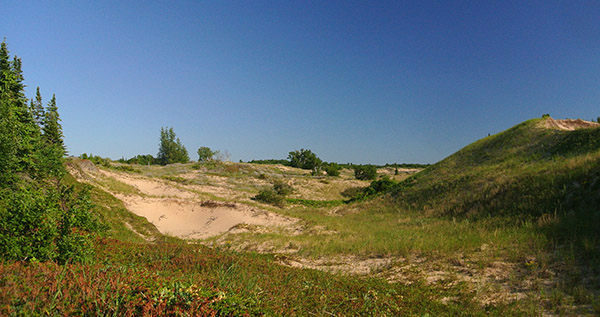 The Michigan Chapter of the Nature Conservancy began preserving the sand dune habitat in 1988 when Steve and Connie Zetterberg donated the 71 acres adjacent to the lighthouse. First known as the Point Betsie Natural Preserve, the area has since been enlarged to 100 acres and renamed the Zetterberg Preserve of Point Betsie. 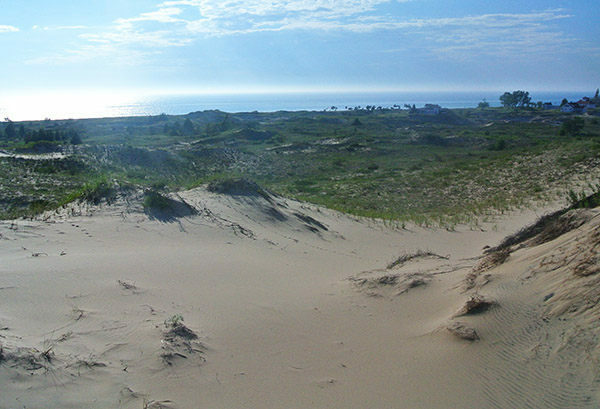 Most of the point is fragile open dune habitat extending a half mile east from Lake Michigan. But the preserve also contains interdunal wetlands and tracts of boreal forest. Flora ranges from Michigan lily, marram grass, beach pea and hoary puccoon in the open dunes to forested islands of balsam fir, paper birch, red oak and creeping juniper. Thriving within the preserve are threatened species such as Pitcher's thistle, fascicled broomrape and the Lake Huron locust. Point Betsie is also an important resting site for migratory birds and offers excellent birding opportunities during the peak migration periods in May and late August through September. Migrating species include the peregrine falcon while cedar waxwings are often spotted in the pockets of forest and sandpiper and killdeer along the beach. Other than a short segment of trail that extends south of Point Betsie Road, there are no official foot trails in the Zetterberg Preserve so the Nature Conservancy asks visitors to respect the fragile ecosystem when hiking. The majority of this popular 1.2-mile loop is along the trail, the shoreline and Point Betsie Road, with only a half mile of unmarked route through the open dunes. From The Nature Conservancy sign, a sandy, soft but still distinct trail heads south, with a stand of pines to the east and open dune country to the west. You skirt the base of a dune briefly, pass a second pocket of pines to the west and then traverse the edge of a small blowout , where the trail fizzles out. Swing to the west and trudge to the top of the dune through the loose sand. At the crest, reached at Mile 0.3, is a view of Lake Michigan straight ahead, the Point Betsie Lighthouse to the northwest and open dune country all around. 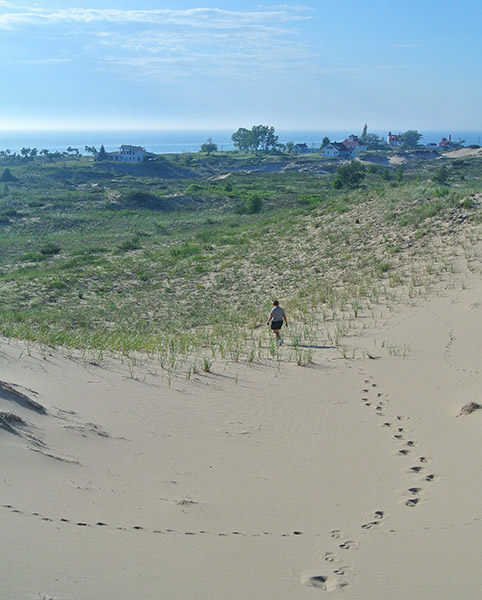 Descend the dune and head for Lake Michigan along the easiest route between the many small dunes and hills. Mostly likely, you’ll pass through a series of interdunal ponds, small seasonal bodies of water that may or may not be there depending on recent rainfall. At Mile 0.7, you climb a low ridge and descend to Lake Michigan. Follow the shoreline north (right) with the impressive lighthouse tower of the guiding you. At Mile 1, just before the lighthouse, a sandy path departs the beach and arrives at the parking area. Also located here is the paved trail to the lighthouse and the Boat House Museum. It’s a quarter mile east along Point Betsie Road to the trailhead. There are no facilities near the trailhead or in Zeterberg Preserve but there are restrooms, drinking water and a swimming beach at Point Betsie Lighthouse. The first floor of the lighthouse is a maritime museum focused on the history of the U.S. Life-Saving Service and U.S. Coast Guard at Point Betsie. The most prized exhibit is the fourth-order Fresnel lens that provided the station’s sweeping beam for almost a century and was eventually returned by the Coast Guard. Friends of Point Betsie Lighthouse have also renovated the nearby Fog Signal Building and the Boat House, which houses a gift shop and exhibit room. Point Betsie Lighthouse is open from mid-May to mid-October and the small fee to view it includes a guided tour and a trip to the top of the tower. Check the Friends of Point Betsie Lighthouse web site (www.pointbetsie.org) for a schedule of hours. From Frankfort, head north on M-22 for 4.5 miles and then west on Point Betsie Road. From M-22, follow Point Betsie Road for a half mile and look for The Nature Conservancy sign on the south side of the road. A trail starts near the sign. You can park on the roadside by the sign, or drive to the end of the road where there is more parking near the lighthouse. For more information, contact the Friends of Point Betsie Lighthouse (231-352-4915) or the Michigan Chapter of The Nature Conservancy at (517-316-0300).